Escape Henry Cow is a new point & click escape game free from ajazgames. 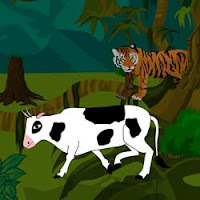 A cow from a nearby village is grazing near the forest and enters it without realizing it is being watched by a tiger. The cow needs your help to escape to safety .Find the clues to help the cow escape and feel satisfied over saving a life .All the best, have fun playing the free escape game from ajazgames.